Plans have been put forward for the West Balmedie Estate by the Aberdeen architect firm David Murray Associates (DMA) to completely overhaul the land previously occupied by the East Aberdeenshire Golf Course at Millden, south-west of Balmedie on the other side of the A90 Aberdeen to Peterhead road. If approved by planners, about 25% of the properties would be classed as affordable, with shops, business space, playing fields and other amenities also proposed. 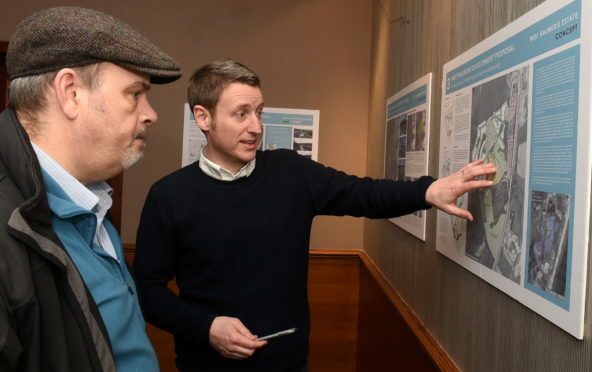 Last night, local residents examined the early plans for the expansive project at a public consultation in the village’s White Horse Inn. David Murray, from DMA, said: “We have had a very good response, and a lot of positive comments from people – but not everyone of course, as a number of people have raised some criticisms. “But overall, people seem to be supporting of the project. “I’ve heard from a number of people taking part that they’re happy that we’re proposing a mix of different options here, they’re commenting that a lot of our ideas are quite logical. “Things like retaining the mature and semi-mature trees of the former golf course, creating footpath links from the development to Belhelvie, Potterton and of course Balmedie, and other parts of the project are getting a lot of positive feedback. “We’re showing there’s potential to accommodate a health centre on the site, which the community I believe have been wanting for some time, without success. Neil Strachan, project manager at DMA, added: “I’ve been speaking to a lot of parents that are worried about the constraints at the existing school, and are quite excited at the prospect of a purpose-built facility. A number of developments are currently on the table for Balmedie and surrounding area, including the planned Trump Estate at Menie, with more than 500 homes proposed.